We are pleased to once again be collaborating with the CoderDojo London team, to offer a free coding event for 7 to 17 year olds on Saturday the 26th. If you are attending Over the Air, we invite you to register your 7 to 17 year-old (or niece or nephew) to take part in the CoderDojo workshop. They will need to bring a laptop with them to take part, and all minors must be accompanied by a parent or guardian for the entire duration of the session. The event is completely free but numbers are limited so we do ask that you register and get a ticket in advance, including your own name, so that we can plan for the correct numbers. 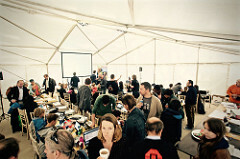 A number of the CoderDojo workshop participants will be invited to do a “Show & Tell” of their work on Saturday afternoon after the Hack Day entrants have shown their hacks. It is entirely up to your child whether they would like to take part in this, but unfortunately we won’t have enough time available for all children to take part. 2016 has certainly been an interesting year – possibly the most glued-to-the-news that we’ve ever been, and huge divisions exposed across western society. An excellent time for us to come together in a celebration of what we can achieve when we share knowledge and collaborate on fresh ideas for a shared future. But it has been a year of changes in the mobile industry as well, with many reorganisations taking place, and tactical changes to how companies approach developer relations and outreach. Many of our supporters over 9 years of Over the Air have been faced with budget cuts, stretched teams, and major layoffs… necessitating our move to a new date from the original plans for September. Winning a few more months to plan the event has unfortunately not had much of an impact on the financial picture – even with the help of all of you lovely people who have chipped in a fiver. We now find ourselves running an ‘austerity’ budget, and are having to get mighty creative on where we can save a quid or two. Can you organisation support us? At the moment we are particularly looking for two Lunch Sponsors – without whom we’re going to have to ask everyone to brown-bag it for the two days. 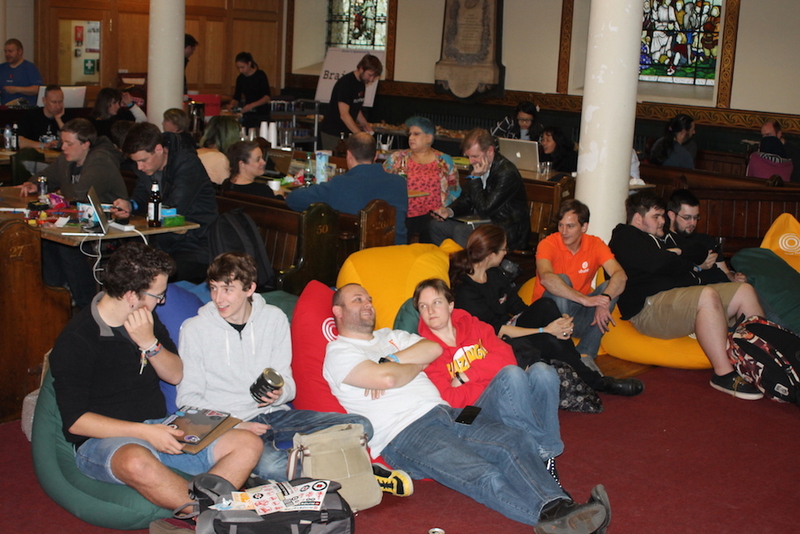 We don’t have enough money for a second Marquee, and we also don’t have money for Bean Bags. Here’s what the budget looks like – we are currently £5k short of the ULTRA minimum budget. Over the Air has always been able celebrating programming & development as a creative discipline, but this year we’ll be inviting you to explore your artistic side as well. We’re pleased to welcome Hercules Fisherman to the team as curator of the Art Space this year! 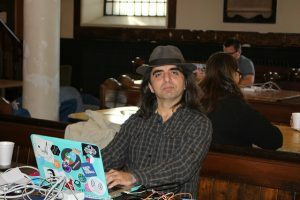 You may know him as Herx, and a fixture of the Hardware Hacking and Start-up scene, but Hercules is an artist as well, and he’ll be bringing a whole new realm of creative expression to the event this year. OTA this year: How do we Extend the Web? Over the Air is a hack day – combining an overnight hack-a-thon format with a developer conference where you can come and learn and hear from your colleagues about new and emerging technologies (and ideas) that you can pick up and use. This year’s programme is coming together. We have some amazing speakers on tap and a few focus areas are emerging. At Over the Air we’ve always had an underlying theme of connected applications and the interconnection of things. We’ve also always had a focus on the open web, and especially the use of the web on mobile devices. This year our focus turns to how the Web can be extended – extended to the world around us (through the internet of things), extended to the way we communicate, extended to new modalities of use and extended to across diverse communities of users. Keynoting our event will be Hadley Beeman, someone well known to the UK tech community. Hadley is currently a member of the W3C Technical Architecture Group which I co-chair and works with me there at the cutting edge of web technologies. Keynoting our second day will be the Léonie Watson, also a leader in web standards and as co-chair of the Web Platform working group also at the forefront of emerging web tech. Ada Rose Edwards will be talking about the future of Web VR, moving the web into emerging virtual reality platforms. Peter O’Shaughnessy will be talking about web bluetooth, extending the web by allowing web applications to connect to devices around you. Tim Panton will be talking about how to use WebRTC peer-to-peer technologies to enable control of connected Internet-of-Things devices in a secure and decentralized way. Alexandra Deschamps-Sonsino will give us a snapshot of the IoT landscape today. Terence Eden will be speaking about some of the dangers and anti-patterns in the Internet of Things. Charlotte Spencer will be speaking about the culture of open source and James Smith will be talking about how we can take open source / open web culture and apply it to the political arena. …and we are still announcing / confirming speakers for both day one and day two of our program. As usual, all of our speakers will be talking about technologies and ideas that we hope our attendees will pick up and build with. Sound interesting? Come join us at Over the Air! The count-down has begun for the 8th annual Over the Air. Have you got your tickets? Register here. Have you proposed a workshop session? Submit a proposal here. Are you going to inspire us with a Lightning Talk instead? Tell us here. Have you spread the word? No? Well, get tweeting!